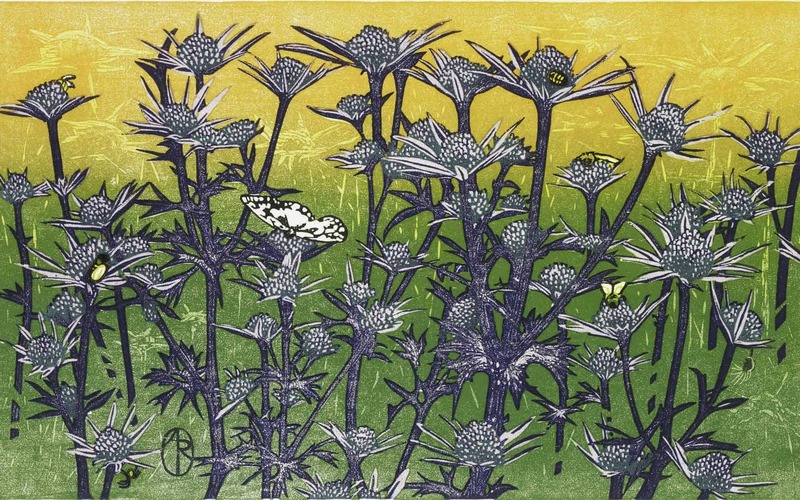 (GOLDENDALE, Wash., June 1, 2015) – An exhibition of 40 prints by internationally recognized printmaker Andrea Rich is set to open July 11 and run through November 15, 2015 at Maryhill Museum of Art, which is celebrating its 75th anniversary this year. Drawing on printmaking traditions as diverse as Albrecht Dürer and Japanese Ukiyo-e, the Santa Cruz, California-based artist creates vibrant, detailed works that are distinctly her own. Three decades of travel have taken Rich to far-flung locales such as Madagascar, New Zealand, Costa Rica, Africa and Europe, to observe common and exotic species of birds and animals. These first-hand experiences are what she draws on to show her subjects in their natural habitats. One of the most fascinating aspects of Rich’s work is her meticulous and labor-intensive process. She designs her drawings based on observations in the field, then carves and hand-pulls prints in her studio. It is not unusual for Rich to carve from 10 to 20 blocks for one final image. Working in the studio full time, a print could take two or three weeks to design and carve the blocks, and another two weeks to press as many as 20 colors on each print. Editions of her work generally number 30 or less. Among the flora and fauna depicted in deep, rich color are elk, sunflowers and sparrows, otter, and thistles, as well as chameleons, European lynx, plum-headed parakeets, indigo buntings, Wilson’s warblers and calliope hummingbirds. An Abundance of Riches features 40 woodblock prints drawn from the collection of the Leigh Yawkey Woodson Art Museum in Wausau, Wisconsin. The presentation at Maryhill Museum of Art is sponsored by John and Laura Cheney. Thursday, July 23, 2015 at 6:30 p.m.
Rich will discuss the woodcut technique – its traditions, complexity and process – and also share her own work in the medium. The lecture is free to museum members / $5 non-members. Media images are available for immediate download at http://bit.ly/1kP1KId. For further information, please contact Rachel Bucci at rachel@maryhillmuseum.org.